Within the varied UK property investment landscape, Investing in Birmingham has become extremely popular. 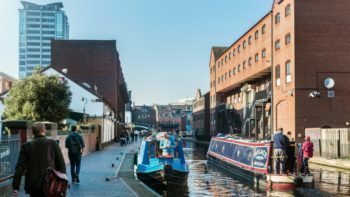 The west midlands is among one the regions drawing the most attention in recent years. Rental returns and potential capital gains upside have been squeezed by high prices in London and the South-East and the UK’s second most populous city has taken up some of the slack. A combination of strong rental returns (up there with the UK’s best), comfortable margins for continuing short and medium-term price growth, positive demographics and a burgeoning local economy all support Birmingham’s property investment business case. In this report, we’ll present the key data on Birmingham as an economy, the city’s demographics and the residential property market. We hope to provide a great hard data starting point for those researching investing in property in the UK, or Birmingham more specifically. Boasting a population of over 1.1 million, and the surrounding West Midlands the most densely populated region the UK (circa. 5.7 million) outside of Greater London, the UK’s second largest city is young and multicultural urban zone. The average age of Birmingham residents is a youthful 34 and an impressive 40% of the population is under the age of 24. Birmingham also has a major student population. Its 5 universities and 5 colleges for further education contribute a combined 73,000+ students to the city, making it the country’s second largest student city outside of, again, London: a snippet of demographic detail that will be of particular interest to anyone assessing student property investment. Population growth projections from 2012, the most recent, forecast Birmingham’s population to grow by 12.2% between 2012 and 2032, which would take the city’s size to somewhere around 1.25 million. The wider West Midlands population is forecast to comfortably top 3 million within the next decade. Add annual tourist influx of over 30 million visitors and it all adds up to a young, bustling city. As might be expected for the UK’s second city, Greater Birmingham’s economy is also something of a juggernaut, contributing £23.2 billion to the UK’s GDP in 2014. The wider West Midlands has a total economic output of £94 billion. Only London has a larger economy. Situated in the Midlands, though just an hour and a half north of London by train, 98% of the UK market is within 4 hours travel time of the city, making it an attractive UK headquarters for companies. There are also 143 direct connections from Birmingham International Airport, facilitating business links with the rest of Europe and the world. We’ve already mentioned the 5 universities and 5 further education colleges Birmingham hosts. There are a further 20 universities within an hour of Greater Birmingham. Retail is also booming and Birmingham is in the top three UK shopping destinations almost every year. The most recent available statistics put retail expenditure at £2.43 billion. With annual spending on clothing at £313 per capita, Birmingham is the UK’s most fashionable city, ahead of even London. Employment statistics show one area that Birmingham can still improve on with 67.7% of the city’s population economically active compared to a national average of 77.8%. Over 2015, unemployment sat at 9.4% against a national average of 5.2%. While highlighting one weakness in the city’s economic fabric, these stats show plenty of room for growth in what is already the country’s second largest economy. The median gross weekly pay for full-time workers in Birmingham comes in at £488.2, compared to a national average of £527.7. Those working in Birmingham earn more or average than actual residents with median gross weekly pay of £538.7, demonstrating the city’s commuter drawing power. The services sector is the city’s largest contributing most to both employment figures and overall economic output. Within services, health is the largest industry, reflecting the fact that the city hosts a number of large hospitals. The youthful Birmingham population and high density of universities and graduating students, together with comparatively lower salaries in the city has proven to be a significant draw for Foreign Direct Investment in recent years. The 2015 UK Attractiveness Survey, an analysis of foreign direct investment (FDI) into the UK over 2014, highlighted that the West Midlands region saw the largest number of new FDI projects in over a decade. 92 were initiated, up 46% on 2014’s 63. Birmingham City Council’s master vision for the future is heavily focused upon upskilling and driving professional qualifications within the city’s significant migrant population. Adult education is a particular priority. Birmingham’s 20-year ‘Big City Plan’ was launched in 2010 and will expand the city centre by 25% to cover 800 hectares, including broad upgrades to the urban environment and connectivity. Investing in Birmingham key infrastructure and transport projects have added to this sense of urban regeneration and transformation. The first phase of the £56bn high-speed HS2 railway connecting London to Birmingham, Manchester and Leeds is due to open in December 2026. HS2 will bring travel time between London and Birmingham down to 40 minutes and is expected to have a significant impact on the local economy. Birmingham’s residential property market demonstrates significant growth potential. A large, growing economy and positive demographics, as well as significant numbers of higher paid commuters travelling into the city, support the trend of strong future house price growth in the city proper. In 2016 Birmingham house prices rose faster than those of London. The average house price in the city as of December 2016 was £165,249. That marked a 7.7% rise from the same time the previous year or an average of £11,801 per property. The UK average house price growth over the same period was 7.2%, putting Birmingham ahead of the curve. The city has seen consistently strong growth in house prices since 2011 and with the UK average house price £220,00, almost £55,000 higher than Birmingham, there is still plenty of room for growth. According to analysis from property peer-to-peer lending platform LendInvest, using Zoopla data, Birmingham residential property shows among the highest rental yields in the UK. Four of the 10 highest rental yielding areas in the UK are in Birmingham, with 13.6 per cent in B44, 11.9 per cent in B42, 10.5 per cent in B98 and 9.1 per cent in B23. A recent Knight Frank study also forecasts strong housing price growth expectations for investing in Birmingham and the West Midlands region, with at least 10% expected between now and 2019. The same report highlights central Birmingham as one of the regions likely to outperform the wider region. Strong price growth is underpinned by a supply shortage. Knight Frank forecast that across Birmingham, the expected supply of new homes is set to fall short of the potential growth in households by an average of nearly 2,000 a year between 2015 and 2019.